Have a bachelorette party or girl’s night out coming up? Plan accordingly to ensure that the night is a success. For an evening of wild fun, visit the men of Aussie Heat. This popular Las Vegas male revue show is hosted at Planet Hollywood Resort and Casino located on South Las Vegas Boulevard. This unforgettable show features an all-star cast of muscled men from down under who have both talent and good looks. First seen on “Australia’s Got Talent” and “So You Think You Can Dance Australia”, Aussie Heat has quickly become a major success on the Strip. Las Vegas is one of the only places in the world where you can go to engage in a little naughty fun in a safe and laidback environment. The men of Aussie Heat aim to bring your fantasies to life on the main stage in an electrifying experience you must see for yourself. Each of the men possesses professional dancing skills, from freestyle hip-hop to break dancers and poppers. It’s no secret as to why the men of Aussie Heat have quickly become one of the top-rated adult shows currently in Las Vegas. Aussie Heat is not entirely new to the Las Vegas scene. They first began their performances in Las Vegas back in July of 2015 where they were asked to perform their male revue act at the D Hotel Showroom at Freemont St Las Vegas. During this time, the group had a seven show per week contractual residency. Soon, the guys were asked to perform directly on the Strip where their fame grew by leaps and bounds. Between their authentic Australian accents, sultry dance moves, and near-perfect bodies, the men of Aussie Heat know how to put on an incredible show for women of all ages to enjoy. The entertainment begins the minute you arrive to the venue. Before entering the theater, you’ll have the opportunity to grab a stack of ‘Hunk Bucks’ to use during the show. Raise these false dollar bills in the air during the show to get some special attention from the performers. Of course, you must be at least 18 years of age or older to enter. Whether you’re in town for a bachelorette party, divorce party, girl’s night out, or just a relaxing night out on the town with a friend or two, an evening spent with the men of Aussie Heat is an evening well spent. Originally known as Aussie Hunks, this charismatic group of young men continues to adjust and upgrade their show to boost the entertainment value and provide women with a wide range of dance routines and fantasies to enjoy. Every time you come for a show you’re sure to see something you haven’t before. However, you can count on a few things to stay the same, including a high-energy soundtrack that will keep you on the edge of your seat, as well as a hip-hop and street dancing style that incorporates strip teases and sensual dance moves. There’s nothing sexier than a man who can dance. For your chance to see the guys perform in person, Aussie Heat performs every night at 10:30 PM with the exception of Monday and Wednesday nights. On average, the show runs about 75 minutes. After the show has come to a close, feel free to linger at the bar and enjoy a cocktail with the men from Aussie Heat. Don’t settle for inferior male strip clubs that hire guys with minimal talent. Aussie Heat is the best in Las Vegas. 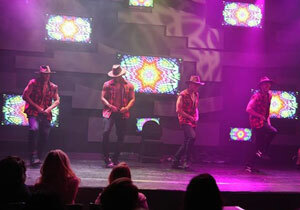 For more information about this popular male revue show, contact Vegas VIP Services today.